If your dog smells musty or sour after a swim—like when you haven't dried your towels in the dryer long enough or left a wet washcloth sitting in a pile—it's not an easy smell to get rid of. The stench is even worse when the dog is wet. It's also particularly pungent with some breeds like retrievers and other water dogs that have naturally thick, oily coats. While dogs' fur helps them to repel water easily and dry off quicker, it’s not as great at keeping them free from odors. The problem is that your dog's coat traps and absorbs the water's bacteria and organic matter. When your dog is done swimming for the day, rub baking soda or cornstarch into his coat while it’s still slightly damp, and then brush it out. That should help reduce the smell... at least until your dog takes another dip. Another easy fix is to keep your pet's hair short which lets the coat and skin dry out quicker. You can also try a deodorant spray with lanolin or a non-soap cleanser with oatmeal, both of which you'll find at pet stores. While these products won't eliminate the smell, they bind to the hair and help mask it. Don't over-bathe your dog with shampoo, as the soap can strip the natural oils and make the skin dry and itchy. Yeast infections are a common occurrence in dogs that love the water, like Labrador Retrievers. 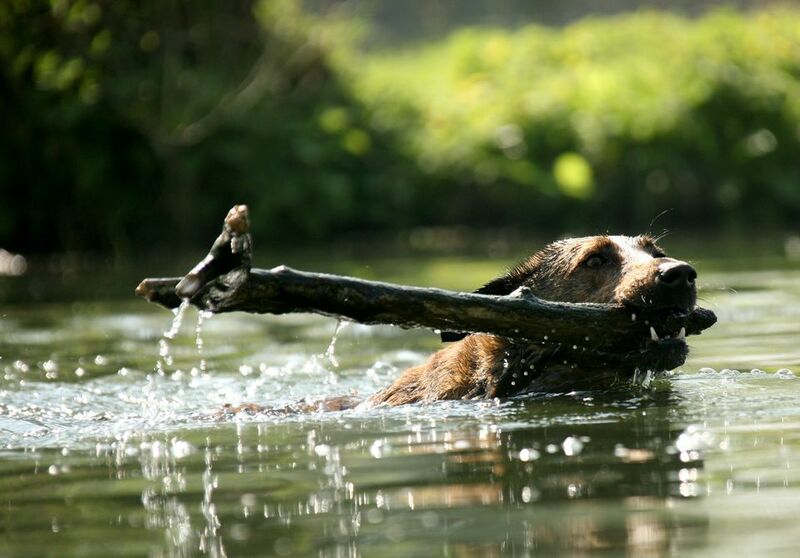 A dog's post-swim shake doesn't always do the trick at drying it off, and yeast can breed in areas that are warm and moist. Also, if your dog is even slightly overweight, skin wrinkles can form which are the perfect place for yeast and bacteria growth. A sour smell can be the first sign of a skin infection. Take a good look through the fur and see if you notice any pimples, open sores, boils, or rashes which can occur anywhere. While you might not see anything, you'll definitely smell it. If you think a yeast infection is present, try a solution made from equal parts white vinegar and water which works to lower the skin's pH. Spray it on the coat and don't rinse. You can use this as a last step after shampooing with a good de-greasing shampoo. You can also give your dog digestive enzymes and probiotics for a yeast infection which helps balance the pH in the gut. You can offer plain yogurt with live cultures; just make sure there is no sugar or sweetener in it. However, do check with your vet because if there is an infection on the skin, a prescription for oral antibiotics or anti-fungals may be necessary.